As I’ve probably mentioned before, randomness and probability are highly unintuitive ideas. Not that we can’t understand what they are, but that their natures make it difficult to predict what will happen in specific situations. 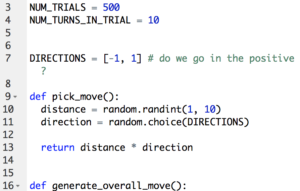 One great example of probability comes from an idea we call the random path. Imagine a person walking down the street. Before taking a step, they have to spin around until they are facing in a random direction. This erratic motion could lead to a completely chaotic mess with interesting applications to study, but this experiment also has some problems. Motion creates momentum, so our walker might tend towards one direction over another. They might also spin for the same amount of time each step, always turning precisely 270 degrees. Instead, let’s look at the simplest version of this example: the one dimensional path. We’ll start by setting a meeple on the zero step of a physical number line. For each step, we’ll flip a coin and roll 1d10. If the coin shows heads, we’ll move to the left a number of spaces equal to the d10 roll. If the coin shows tails, we’ll move to the right. a. Can we predict where the meeple will be after 10 turns? b. How long does the number line need to be for a 10 turn walk? So, like any good statistician, I first tried it out. I completed a series of ten experiments and recorded my results. My results varied from 12 on the right to 31 on the left. Seven of my random paths ended on the left, while only three went right. I hadn’t expected any significantly larger numbers, but I was certainly hoping! I could have instead looked at this mathematically right from the start. D&D players are very aware that the average result of a ten-sided die is 5.5. I could just consider an average roll every turn. We might also expect that in ten coin flips, we might get heads and tails each five times. In that case, our theoretical average result would be to end up right where we started at zero. 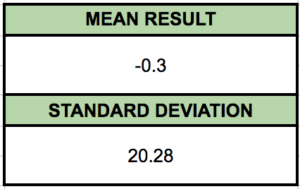 My results are clearly not average, because I never returned a zero! My results weren’t far off, but I need more data to see what’s about to happen. I sent a request out on Twitter and within minutes (Thanks @LtHummus! ), I had 1000 additional results and the ability to create as many more as I wanted. What I ended up confirming was one of the most important theories of statistics: given enough results, the experimental mean matches the theoretical. This doesn’t mean I can tell precisely where an individual path will end, but it does give us some place to start. The second task is significantly more interesting. It feels more likely that we’ll get a result like zero, but the big question is how far does our number line need to stretch. We can see that a result of 100 to the left or right is entirely possible, but it isn’t very likely—in fact, the odds are 1 in 5,120,000,000,000 that the meeple ends up at one of the two extremes! So, how many numbers do we need in our line? Take a look at this data all grouped up. Our experiment forms a simple bell curve! This kind of data is the easiest to analyze. We can see the most of the results are clustered around zero. To talk more mathematically about this clustering, we need to know the standard deviation of our data. The standard deviation measures how grouped our data happens to be. If the standard deviation is small, the data is clumped around the mean. With a large standard deviation, the data is more spread out. Lucky for us, we’ve got a solid bell curve. In a problem like ours, statisticians know that 68% of all results will lie within one standard deviation of the mean. 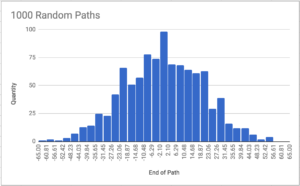 So 68% of all paths will end somewhere between 20 to the left and 20 to the right. To get 99.7% of all paths in our number line, we only need to get out to 61 on each end! Anything beyond that would be a pretty rare outlier. Even in the 1000 data points I took, none of them fall outside this range. Overall, our experiment is impossible to predict. Given the random nature of each path, there are just too many possible permutations to consider. However, we can certainly say that it is very likely that the result will end between 61 to the left and right, and we definitely wouldn’t be surprised if it was much closer to zero. Going deeper requires some tougher statistics that we’ll save for another day. Why in the world am I talking about randomness like this? Because patterns exist in everything. We can look at self-similarity in chaos theory and fractals, but let’s think about where randomness shows up in games. When someone dislikes a game because it is “too random,” often it’s because the final outcome is too hard to predict. A chosen action may not propel someone in the direction they were hoping. Games involving chance make it clear that specific outcomes are not completely within a player’s control. Clank! isn’t too different from the random path problem. Looking into whether a player will be able to move the right number of spaces involves analyzing their deck and doing a very similar kind of calculation. In this case, rather than rolling 1d10, we’re considering how many cards in the deck have a movement icon. Cards in Clank! may have icons for Purchasing, Movement, or Fighting enemies. The success and consequences of a player’s actions depend on what happens to be on the cards they draw that turn. They may have an average of one movement a turn, but may instead end up with turns having no movement or other turns with three moves when only one is needed. What we can see from problems like the random path is that if I have 19 cards in my deck and only 4 have a movement icon, the probability that I draw 3 or 4 of them in one turn is very unlikely—but can I get 2? Is that too extreme? All of that leads to the tension that helps make Clank! such an incredible game! Other games involving randomness include dice games like Zombie Dice and Las Vegas, but also resource gathering games like Catan or Valeria: Card Kingdoms. In each of these games, looking at all the possibilities and paring them down to the realistic probabilities is the key to defeating their internal randomness. 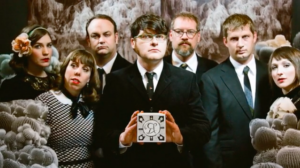 Illimat is a wonderful new board game, developed as a collaboration between prolific game designer Keith Baker and prolific musicians The Decemberists. Years back, the band members shot a series of promo photos with an arcane looking game board, provoking a sense of deep mystery amongst their fans. 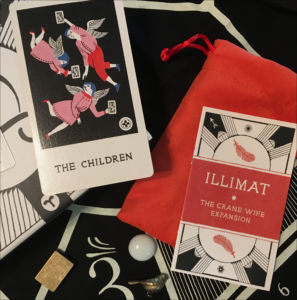 The object, known as the Illimat, was covered with strange sigils and odd patterns, and generally looked unlike any other game. Eventually, these two Portland-based creators met and decided to build a set of rules to turn this mysterious object into a playable game—and Illimat was born. As someone who demoed Illimat many times at different conventions, I grew used to repeating a few quotes about the game. “It feels like something you’d find in your grandmother’s attic.” Which is both an intriguing phrase and absolutely true! Illimat is based on classic cardgames called Cassino and Scopa, giving it a feel very different from most modern board games. The Children love to steal your Illimat cards. In most games we play these days, designers fight to avoid wasted turns—no one should have a turn where they don’t change the state of their hand or the game, right? Some deckbuilders have unfortunate turns when you don’t buy anything, but these are far and away atypical moments in the game. On the other hand, the Illimat endgame can feel a lot like a round of Hearts. If most of the hearts were thrown out in the middle of the round, the end has little value for any player. Likewise, if a player realizes they cannot take any of the remaining tricks, they may as well play with their cards face-up. In Illimat, the last few turns can be filled with throwaways that have no impact on the final score. During my demos and subsequent plays of Illimat, I found that this endgame feature, built directly from the classic games I grew up playing, often frustrated new players. With that in mind, I wanted to delve a little bit into the mechanics of Illimat and see exactly where to find the point-grabbing action. Some of this analysis is from my personal experience, so may differ from your experience based on playstyles. Every time a player takes a turn in Illimat, they may take one of three actions: Sow, Harvest, or Stockpile. Each of these requires a single card in hand to be played into one of the four quadrants, or fields, on the board. In a two or three-player game, there are four suits of thirteen cards each, while a four-player game adds a fifth suit. 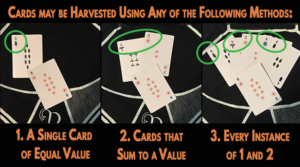 The most used action is Harvest, which is playing one card from your hand to Harvest a card with the same number value from a Field. Both cards are then added to your Harvest pile. When Harvesting more than one card, all of those cards are added to your Harvest pile. Harvesting is absolutely an opportunistic action that is not always available to a player, which means it pays to be efficient. The more often I can grab two or more cards in a single action, the better off I am. At the end of the game, the player who has Harvested the most cards gains four points—by far the largest source of points in the game. In most games I’ve seen, the winning player has Harvested from 16 to 24 cards. Whenever a field is completely cleared, a quick check is made to see if it should be reseeded with three new cards from the deck. Reseeding adds more options to the board, while simultaneously reducing the number of turns left in the game. Reseeding can happen anywhere from an unlikely zero to an equally unlikely seven times. In my experience, for a two-player game, each player has sixteen turns. Reseeding will likely occur either three or four times. A three-player game is much faster with each player taking ten turns. Due to the fast game, reseeding will likely occur either four or five times. Finally, while a four-player game adds a new suit, players will still only get nine turns. Reseeding is more frequent, and will likely occur five or six times. There is a very interesting thing to notice on this table, which is the moment when Harvest efficiently become a better source of cards than Harvesting constantly. Finding powerful ways to Harvest multiple cards per round clearly leaves you with extra turns when you don’t need to Harvest at all—including those final rounds! Here’s the moral of this particular story: Illimat is a game about Harvesting efficiently at opportune moments, not slowly ramping up to a powerful Harvest-filled endgame. This efficiency will leave us with turns that feel wasted, not because we aren’t playing well, but because the game doesn’t require us to have great opportunities every single turn. We can create those moments by Stockpiling (an action requiring a post all on it’s own!) but us simple farmers need to be ready to capitalize at any moment. I love playing Illimat and I have been very fortunate to be part of the playtest process for a long, long time. Beyond the incredible art by Carson Ellis and the fantastic theme and mystery given by The Decemberists, the gameplay created here by Keith Baker will keep me embroiled in the complicated act of farming for years to come. 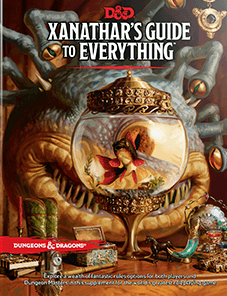 Xanathar is basically designed to give monologues to his goldfish every single day. In a recent Unearthed Arcana post, Dungeons and Dragons Creative Lead Mike Mearls talked about what he describes as the “three-pillar experience.” The overall design behind D&D is that the game is supported by three major activities: combat, social interaction, and exploration. Unfortunately, combat is the easiest to define in terms of actions and rewards. Since 3rd Edition, player experience points has come almost entirely from these combat encounters. Nods have always been made towards story rewards, but never in as clear a way as the amount of experience points gained per destroyed skeleton and zombie. In a very simple game theoretic way, if rewards only come from combat, then doing anything else is a waste of time. Mearls has provided a plan in his post to overhaul the entire experience system to one based on milestones representing each pillar. While there is a lot of elegance to this approach, I think it serves to simplify things rather than to make everything equally robust. Which is why I decided to come up with a solution of my own. The Monologue Mechanic is my approach to bolstering the social interaction pillar of gameplay in a narrative way. I introduce a series of NPCs called critics, who only exist to learn about the players and their journeys. They want to hear the stories of each adventure and turn them into legends! Or potentially make fun of the heroes, which is why I used Statler and Waldorf as my major examples. One method to creating legends is to build real villainous monologues. When a hero gets a chance to listen to a diabolical rant, they suddenly have plenty of new opportunities to build a story. One hero might furiously scribble down the entire evil plan, making sure to get every nuance about both the future and the past. This hero wants to tear down the villain’s entire engine, just like most of the crime dramas I’ve ever seen. On the other hand, some heroes want the chance to engage with the villain and build up a dialogue before the climactic encounter. When face-to-face with the lich mastermind, a hero might want to drop in a few clever one-liners! As a reward for their actions, heroes gain everlasting renown across the land. While a hero can grow a good deal of fame by helping a community, things grow exponentially when someone is out there telling a real legend. A famous hero can change the world in wildly different ways than one who acts in secret. A robust Fame System can also give characters rewards in terms of recognition and even the kind of Fans who would be willing to put it all on the line to help their favorite champion of the land. My hope is that by creating The Monologue Mechanic, players will be more excited to engage in their own heroic story. Of course, other game systems exist that put the focus on different pillars than D&D. Fiasco is all about improvising and building a complete story from some cleverly linked details, and while combat is possible, it’s all just another step in the wild and sometimes heavy narration. Numenera leaps into exploration by giving players a vast unknown world that is tied to our own in only the most ephemeral ways, then providing a settlement to build up in the face of that mystery. I think role-playing is at its best when tied to a strong group of story-driven players. If that sounds like something you might be in for, feel free to check out The Monologue Mechanic on DMs Guild now! Over Thanksgiving, we shared Clank! In! Space! with some friends of ours and I had a few moments of absolute terror. What if the game was too hard? What if they hated it? What if they stormed out with all of my favorite leftovers?! It ended up being just fine, but I was very concerned that I’d picked something that was a little too complex. Judging a new audience for their tabletop savvy is always difficult, but it becomes even worse around the holidays. When I want to share my love of games with folks who don’t play this kind of game, what do I pick? All of you game theorists should quickly note that I’m out for myself here. I want to play a game that I enjoy. I want to play a game with some heft, but I also want to play a game that everyone else will enjoy too. I’m also not necessarily interested in finding a gateway game that will lead new games into the world of tabletop. I just want something fun for all of us while we wait for the tryptophan to wear off. Trick-Takers: For families that grew up playing Hearts, Spades, Bridge, or Euchre, Diamonds is a perfect step forward into tabletop. The rules of the game are similar to these classics, but each suit has a unique interaction with the game itself as you battle over a hoard of diamonds. Whenever you win a trick with Diamonds, you pick up one of the diamonds from the hoard and place it into your Vault. When you win with Hearts, you pick up a diamond and place it in front of your vault in the Showcase. Spades lets you transfer diamonds from your showcase into your vault, and Clubs allow you to steal from other players. Suddenly, everyone is playing to take specific tricks which allow them to perform the actions they want. It has multiple strategies that everyone can understand after only a few tricks. Plus, there are victory points! Every diamond in your vault is worth two points and every diamond in your showcase is worth one each. 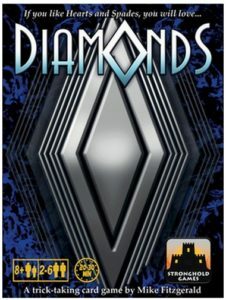 Diamonds is a fantastic game for families who have been playing games for decades! P arty-Party: For a brand new group of gamers, it is hard to find a game as good as Codenames Duet. This brilliant take on the original asks every player to be both the clue giver and the clue guesser during the same game. Like the original, you have a series of 25 words in a grid that need to be sorted through to find the spies among the passers-by. However, in this version, all players split up into two teams, and each team gets their own map that tells which of the 25 words are spies. The map is double-sided and each side is different! 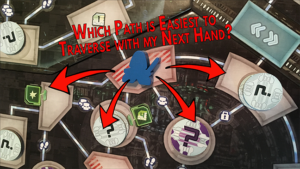 There is always some overlap, which can be useful, but there are also a limited number of turns to finish the game. If all the spies from both teams are found, everyone wins! Otherwise, everyone is going to have to try again. 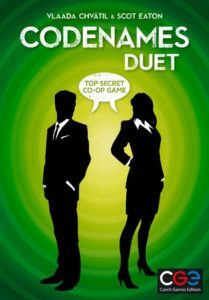 Duet eliminates the competitive aspect of Codenames in favor of a limited information approach to cooperation that depends on tactical play. It’s a quick and easy introduction to games and I constantly see brand new players be completely immersed by the second game. Light-Cycles? : Look, sometimes you just want to play a game that enthralls new players because it’s so dang cool. That game is Lazer Ryderz. 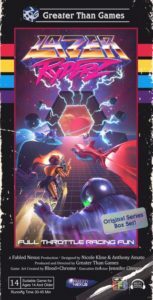 First off, the incredible box is designed to look like a boxed set of VHS tapes straight out of a 1980’s neon-soaked action movie. As you open your individual box, you are met with a bunch of tracks, both curved and straight, that represent your movements in the game. What does the board look like? It’s just whatever table you might have. You can add obstacles if you want, but the important thing is to set down a few score tiles. Players score points when the fly all the way through these tiles. Of course, there’s also the fact that you’re basically riding light-cycles. Like in TRON, you leave a wall of light behind you, and when other players crash into it, they have to restart from the table’s edge! The first player to collect three score tiles wins! The game is super easy to get into and the strategy is clear right from the start. Plus, it’s got just enough randomness to make every single move a risk. I’m a huge fan! All-of-the-Dice: A family raised on Yahtzee and Boggle loves shaking up and rolling a bunch of dice. So why not play Las Vegas? 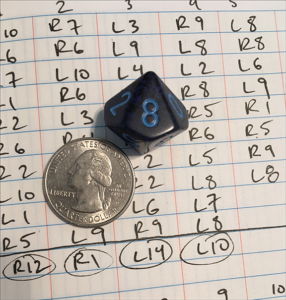 In this game, every player has eight dice they get to roll! EIGHT! On each turn, a player rolls all their dice and picks one of the six casinos. 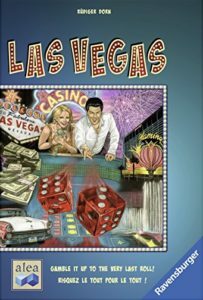 Each casino is labeled one to six, and when you choose a casino, you take every die with a matching number and place it on that casino. On your next turn, you roll your remaining dice and continue the process. At the end of the round, the players see who has the most dice of their color on each casino. The winner gains a large amount of money! Potentially, second and third place earns a lesser amount, but they may also get nothing. If two players ever tie on a casino, neither one gets anything! This game has an incredible amount of strategy for such a simple, simple setup. Highly recommended. That’s it! Next time you head over to see some family or friends who aren’t quite game people, bring one of these along. Not only will you get to play something simple and straightforward, but you’ll be able to continue some serious strategic practice. Earlier this month, I had the amazing opportunity to sit down with the one and only Joseph Scrimshaw and talk about game theory. I know I talk about it a lot from my own academic point of view, but sitting across from a wonderful comedian turned everything into an incredibly interactive conversation. This is the kind of thing I wish I could do every day. Listen in, if only to find out how to deal with wild bears who want to play games with you! It might just save your life. Ridiculous, right? This is a record-breaking moment in the history of a game show that has been on TV since 1956. It’s also a perfect moment to take a look at some game probability as we determine exactly how ridiculous this moment actually is. Let’s start with Wilbert. Determining the probability of an event occurring requires us to create a pretty simple ratio. On bottom of the fraction are the number of possible outcomes in a situation. On top, the number of favorable outcomes. In this case, we want to find out the number of possible spins of the wheel and the number of ways to get $1.00. How many possible outcomes are there? There are twenty different spaces on the Wheel, starting at 5 cents and increasing by 5 all the way to $1.00. Your first spin can have any of those twenty results, as can your second spin. However, you only get a second spin if you don’t land on $1.00 the first time. There are 19 ways to get a second spin, and a second spin has 20 different results. We call this the sample space—the group of possible outcomes. Okay, so how do you get a $1.00? You can either spin it on your first go, or get a total of $1.00 by adding up to spins. If your first spin is 15¢, the only way to get a dollar is with 85¢. 30¢ has to match with 70¢. For each spin, there’s only one possible second spin that nets $1.00 total. Which means there are twenty different favorable outcomes that lead to $1.00. Notice here a trick about probability: we consider 35¢ + 65¢ to be a different outcome than 65¢ + 35¢. Order matters. So, not significantly different than rolling a 20 on a d20. But it didn’t just happen once… it happened five times in a row. What are the odds of that? Here’s a moment when you often stump students in a high school probability class (Hi there, former students! –Rich). There are five of them… maybe we should multiply by five? But that makes it more likely that the event occurs, which is wrong. So then maybe the next step is to divide by five… this is the point where I put an X next to the test answer, hope the next one is better, and plan to have a brief discussion about how probabilities are always horribly unintuitive. 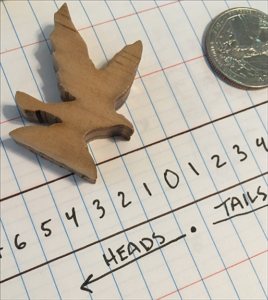 When it comes down to it, the right answer is to build a probability tree. When we do this, we can start to put together the actual solution. In probability terms, this is a then question, as in event A occurs, then event B occurs. In then problems, we multiply the probabilities of each outcome together. Which means the odds of these five $1.00 spins happening in a row is roughly one in two and a half million. How many stars are there in the sky? Would you believe that you only see between 2,500 and 5,000 that are visible to the naked eye at any one time? Think about one star in that vast expanse. One in two and a half million is another few orders of magnitude entirely. So, as much as I enjoy watching Drew Carey’s impersonation of Bob Barker, I’m not planning to see a Showcase Showdown like this one ever again.